Functional escalation passes the incident to another party within the same unit. Hierarchical escalation passes the incident to someone higher in the hierarchy so more resources can be requested. 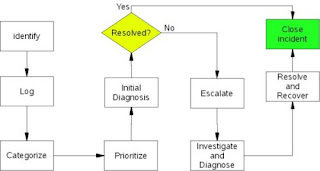 The first step in incident management is identifying the incident. Once the incident is identified, it is logged. The incident is categorized and prioritized. Initial diagnosis is performed. At this point, the person receiving the incident attempts to resolve the incident. If the incident is resolved, it is closed. 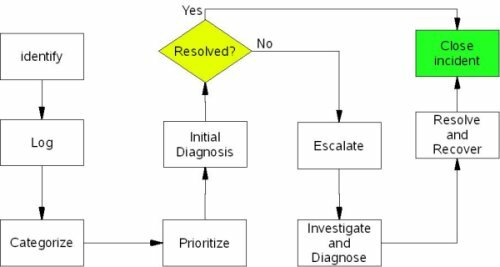 If the incident is not resolved, the incident is escalated to another unit that will resolve it. Investigation will proceed and initial diagnosis is done. The purpose at this point is to fix the incident as quickly as possible. This is done through workarounds or quick fixes. Once a resolution is determined, the resolution is implemented. Recovery can result if the incident is caused by a newly implemented change. The incident is then classified and initial support is given. When the incident is confirmed as fixed, the incident is closed.